It is described a prospective trend in development of equipment for preparation of sand-clayey molding mixtures with a quality control system of prepared mixture. It is described problems during a process of core mixture preparation, used in technology Cold-box-amine. By the examples of active devices, which are used for preparation of sand-clayey core mixtures by technology Cold-box-amine, it was analysed design features of mixture preparation equipment made by INSTUTUTE BELNIIUT. It is given examples of advanced devices which are planned to be implemented in 2008. It is represented an analysis of trends in quality increase and saving of fuel-energy recourses, the basis of which is updating of equipment used in large-scale production of small castings. It is viewed a principle of molding mixture dosing depending on its physical and mechanical properties, disturbing force of vibration and the others similar factors. It is represented an optimal design of equipment units meant for reliable and stable operation in conditions of short work cycle of molding equipment and production prototype of molding machine for production of piston ring castings. It is represented technical characteristics and operation description of small-sized double-rotor centrifugal casting machine mod. 4986, and it is described carried out research works for reveal of features and advantages of centrifugal casting during production of tubular billets of high-duty cast iron and a technology of making casting up to 300 kgs. It is represented new prospective technologies for production of castings with special properties (steel hub, grinding balls) by centrifugal method; it is described its advantages. It is interrelated a production status of iron castings and rate of fuel and material consumption by the example of operation of melting and distributing sections of foundries and it is determined the ways for optimization of their costs. It is given a coefficient of melting slowdown and its definition. It is represented an analysis of factors determining a process of formation of sprayed coatings. It is analysed a character of change in micro-structure and porosity of sprayed coatings upon cold substrate using different composition separating coatings and their transformation during heat treatment at cyclic thermal effects (CTE). By plasma spraying it was made a set of matrixes of casting molds for different purposes, which proved its high operational wear-resistance and performance. 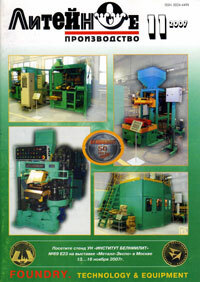 It is represented an analysis of conventional gate systems for making castings of aluminum alloys. It is determined the ways of reducing energy and material capacity, of production of aluminum castings and it is shown that the method of self-pouring is effective in this case. It is described particularities of self-pouring method. Application of self-pouring method is considerably universal and effective because of its flexibility, ability efficiently to influence and to program a process of mold pouring through flow adjusting. It is shown a model of machine designed by INSTITUTE BELNIILIT for making castings of aluminum alloys by self-pouring method. It is represented an analysis of factors of economic efficiency of casting impregnation process as well as analysis of current requirements of engineering to castings. It is described technological features of impregnation technology and it is given examples of used sealant compounds. It is represented a complex of equipment model 46176 for implementation of impregnation technology of castings by vacuum-pressing method. It is described production steps, carried out on the complex during casting impregnation process. On the occasion of the 95th Anniversary of FSUE "MMPP "Salyut"